Art made to attach to buildings or to be given away? Wearable art for street demonstrations or art that sets up a booth at a trade show? 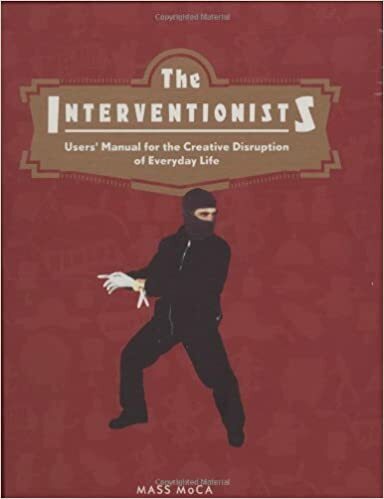 This is the art of the interventionists, who trespass into the everyday world to raise our awareness of injustice and other social problems. These artists don't preach or proselytize; they give us the tools to form our own opinions and create our own political actions. The Interventionists, which accompanies an exhibit at MASS MoCA, serves as a handbook to this new and varied work. It's a user's guide to art that is exciting, provocative, unexpected, inspiring (artistically and politically), and fun. From Michael Rakowitz's inflatable homeless shelter and William Pope.L's "Black Factory" truck with pulverizer, gift shop, and giant inflatable igloo to the Biotic Baking Brigade's political pie-throwing, the art of The Interventionists surveys a growing genre and offers a guide for radical social action.The book classifies the artists according to their choice of tactics: the Nomads, who create mobile projects; Reclaim the Streets, artists who act in public places; Tools for Resistance: Ready to Wear, artists who produce fashion for political action; and the Experimental University, artists whose work engages pedagogy and theory. The accompanying text includes essays by noted scholars putting the work in a broader cultural and social context as well as texts by the artists themselves.